Years of practice paid big dividends for Brad as he grew older. By the late 70’s, he packed his bags (which included his clothes, his toothbrush, and his dummies) and left the humble security of Wellesley, Massachusetts to pursue a career in show business. Soon after his arrival in Hollywood, Brad became a popular performer at some of L.A.’s most respected Comedy Clubs, including THE IMPROVISATION and THE ICE HOUSE. The early 80’s gave this now seasoned performer a chance to expand and travel with his much sought after act. He was hired as an opening act for such stars as JOHN DENVER, CAPTAIN & TENNILLE, and DOROTHY HAMILL. In addition to these tours, he also starred in main showroom revues in LAKE TAHOE, RENO, ATLANTIC CITY, and LAS VEGAS. All of the above mentioned is but a precursor for what Brad Cummings has become today. He has more than conquered the art of ventriloquism, he has taken it to a new plateau. With his innovative approach, unusual characters, and unique presentation, it’s no doubt that he is now a recognizable face in the media. His many television appearances (DAVID LETTERMAN, EVENING AT THE IMPROV, COMEDY ON THE ROAD, CAROLINE’S COMEDY HOUR, COMIC STRIP LIVE, THE VICKI SHOW, etc.) 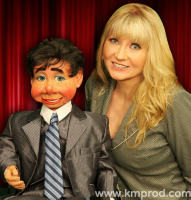 have allowed millions of people to witness his ground breaking style of ventriloquism. 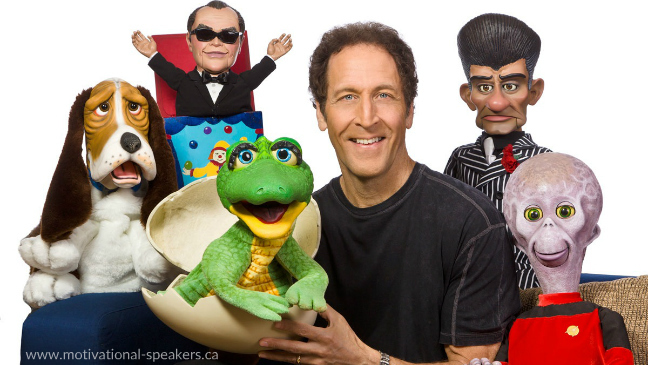 No wonder the prestigious SMITHSONIAN MAGAZINE called him "one of today’s top ventriloquists". 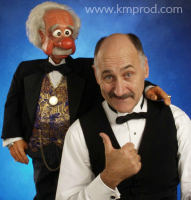 Thank you very much for providing the entertainment for the Clark Memorial Hospital Recognition Banquet in Louisville, KY. Our team members are still telling us how much more they enjoyed this year's entertainment than any we have had in the past several years. I feel your talent, your humor, along with Rex and the audience participation in your act made our event a huge success. Your performance at our Contractor Expo was marvelous. Our nearly five hundred contractors and guests were thoroughly amused and entertained. The audience participation and the references to the local area made it even more enjoyable to all. Accomplishing this and not offending any of our clients was a great feat. You are a true showman. Rex was awesome as well. Thanks for the great entertainment you provided for our OneAmerica Business Conference. Your show was a great wrap-up to our incentive trip and every attendee that I spoke to had only positive comments. Super job Brad! Thank you for arranging to entertain at our recent conference. You exceeded my expectations and were a tremendous success. Rex is truly a unique little dinosaur and has such a delightful personality. Everyone in the audience loved him in the first two minutes and he completely captivated our hearts. Your talent is incredible! Many years ago I sat on the front row for an Edgar Bergen and Charlie McCarthy show. I thought he was marvelous but he definitely can't compare with your quick mind and the abiity to ad lib at will. Audience participation was so appropriate and the person you selected to be your live dummy was the perfect one. You obviously read your crowd extremely well. Thank you again for being a great finale for our conference.